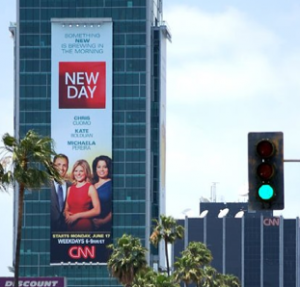 The marketing is in full swing for CNN’s new morning show “New Day.” This giant billboard went up at Sunset and Vine in Hollywood, not far from CNN’s LA bureau. And if you open up just about any magazine (assuming you still do that), you’ll see smiling anchors Chris Cuomo, Kate Bolduan and Michaela Pereira. There’s even a two-page spread in the just-launched magazine Beach, meant for the Hamptons crowd. The show debuts three weeks from today.